For example, broadly speaking, the odds of success are higher when the minority language parent is the main caregiver, and lower when the minority language parent is not. Another example is schooling. When a child receives schooling in the minority language, this raises the odds of success tremendously. On the other hand, the odds will drop by a significant degree when the child attends school in the majority language, particularly if this education offers little or no exposure to the minority language. One more example is travel. The odds of success will generally rise, or fall, in proportion to the frequency of trips taken to locations where the minority language is widely spoken. 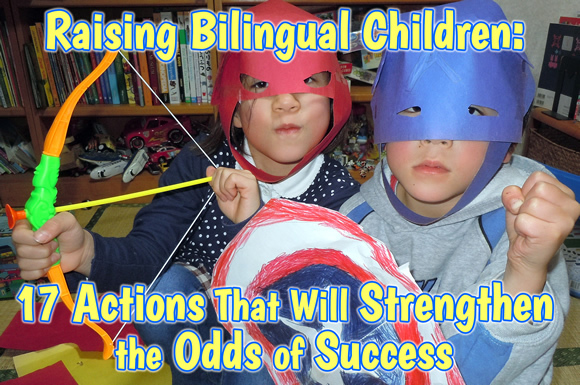 These examples, in fact, cover some of the basic conditions of my own situation…and all three are weighted toward lowering the odds of success: I’m not the main caregiver; my children (now 11 and 8) have always gone to majority language schools; and we rarely travel abroad. 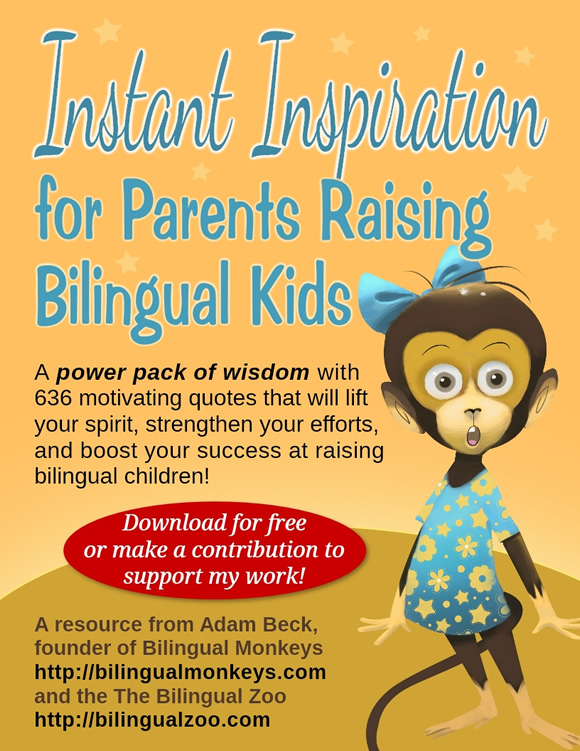 Let me stress, of course, that “success” in raising a bilingual child will naturally be measured differently by different families. The aim itself may be higher or lower, depending on the parent. In my case, my aim has always been high as I seek to foster ability in the minority language that’s roughly on par with monolingual children, in all skill areas. Whatever the aim, it’s a personal decision and I’m happy to support any sincere goal that parents hold. However, it’s crucial that all of us clearly gauge the odds of success for our circumstances and, if the conditions themselves can’t be reshaped in more favorable ways, actively exert the necessary amount of effort, day after day, in order to raise those odds to the degree that will produce the desired outcome. This is why I’ve been so diligently proactive since my kids were born: Because my basic circumstances evoke lower odds of success—and yet my aim is high—I’ve had to overcome these conditions by taking daily actions that will put the odds more in my favor. Below are 17 of these actions. You may not want to, or even need to, undertake all these actions to achieve the aim you seek. But I suggest that the more of these actions you pursue, the more you will raise the odds of success and fuel your children’s language development more strongly. 11. Find or create monolingual settings and situations to encourage active use of the target language. This free eBook can also strengthen your efforts and boost your success. Find out more by clicking the cover. How about you? Are your actions adequate to realize your aim? If not, what more can you do?